Want to get more distance off your tee shot? Who doesn't, right? Now you can with Momentus Power Hitter™, the number one weighted golf swing trainer guaranteed to increase your drives by 10, 20, or even 30 yards. Momentus Power Hitter isn't like the other golf training aids; it incorporates a scientifically-balanced shaft and head weight system to make switching back to your driver a breeze. Ever notice how the PGA Tour pros seem to effortlessly swing their way to 300 and even 400 yard drives? That's because they get hours of daily training that most of us don't have time for. Momentus Power Hitter compensates for those lost training hours - and you'll notice the difference right away. The secret to the professional swing is timing. PGA pros swing with a delayed release of the club head, waiting until the last second before putting all of their power into the back of the ball with maximum force and impact. Momentus Power Hitter swing trainer trains you to adopt that same effortless swing and perfect timing. Just take Momentus Power Hitter to the driving range, hit a bucket of balls, and then switch to your normal driver. You'll notice not only an instant distance increase, but you'll also be swinging the club effortlessly and hitting the golf ball on-target, and on time. "The beautiful thing about the power hitter is that it maximizes your ability to hit the ball as far as you can," says Peter Krause, 2005 PGA National Teacher of the Year. And he's not the only one who loves Momentus Power Hitter. Does the Momentus Power Hitter really work? Just take it from Mike Barge, the Director of Instruction for Hazeltine Golf Club: "Everybody's looking for more distance. 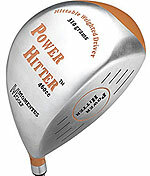 The Power Hitter is something that's going to give you more distance." Achieve perfect timing and effortless, explosive and powerful drives for 10, 20, or 30 yard increases in your tee shots. Try the Official Momentus Power Hitter™ for Yourself with a 100% Money Back Guarantee.